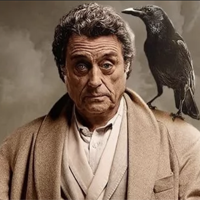 Showing 1 - 15 of 20 articles tagged "American Gods"
Neil Gaiman calls reports of American Gods' problems "fairly hysterical"
The Starz series returns March 10 -- 21 months after its Season 1 finale. “I couldn’t come back without him,” said Chenoweth, who previously starred on Fuller's Pushing Daisies. Neil Gaiman on American Gods behind-the-scenes showrunner turmoil: "It was bullsh*t"
“I was offered the showrunner job several times, and I can’t. The trouble-plagued Starz series released a Season 2 teaser trailer in conjunction with its New York Comic Con panel. American Gods' problems continue as the new showrunner has been "fired but not fired"
Jesse Alexander, who replaced the fired original showrunners Bryan Fuller and Michael Green, has been pushed out himself. Stars of the Starz series posted a video commemorating the beginning of Season 2 production following a high-profile showrunner change. Gillian Anderson's American Gods Media character will be replaced by "New Media"
New executive producer Jesse Alexander has previously worked with former co-showrunner Bryan Fuller on Star Trek: Discovery and Hannibal.